Today’s leg of the A2B Route continued south on Buck and Doe Road. 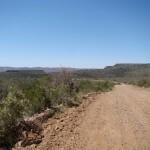 The next few days of the journey will follow dirt roads through rugged and isolated terrain until reaching Peach Springs (about 45 miles). Should be an interesting part of the A2B course. Unusual achiness this morning. Not sure why. I did a systems check while stretching to see which parts of my body, if any, might need a little extra monitoring while running. Left thigh, right calf. I started a little slow to let my legs get loose and warm. There were occasional twinges in my thigh. After about a mile and half, however, things were starting to feel pretty good. So I took my pace up a notch or two. Consistent with the road traffic, I barely had any company on the greenway path. Just one cyclist and a couple dog-walkers. Even though I felt no more pain in my legs from mile #2 on, I spent a little extra time in my post-run cool down and stretch. We will see what tomorrow brings! In the first couple of miles of today’s run, I was feeling some pain in my left inner thigh. Several times, it made my face scrunch. Even so, I made the decision to press forward and “enjoy” my run. Are runners really the “freaks” that people make them out to be? Perhaps . . . . I suppose every pursuit has its extremists who live to continually push the envelope. But runners generally live with the attitude that you can always dig a little deeper. And if you can, then you must! To say that “you can always dig a little deeper” sounds noble. Maybe even inspiring! But to actually do it requires greater-than-normal determination, effort, and pain. In fact, pain and discomfort (and usually fear) are the only ways to know that you are in “digging deeper” territory. Runners, among others, derive a lot of pleasure from crossing that border and staying there for a while. Occasionally – or maybe I should say, inevitably – we push a little too hard. We crash and burn. We dig all the way down to the dreaded running injury. At this point, the runner is temporarily subjugated to the sideline or penalty box, depending on your disposition. Truth be told, it’s no fun being grounded. It’s like being caged. But, it is never the end. Just the opposite, if you choose. Experience has taught me that the combination of proactive, body-respecting recovery and digging deeper can lead to new personal bests and newly discovered strengths that previously seemed unattainable. I am kind of glad to have figured that out. My hope is that the same principle applies to other facets of life. By the end of my morning run, I decided that I am more than flattered! Thank you Lucero for thinking of me upon seeing the running freak cartoon! 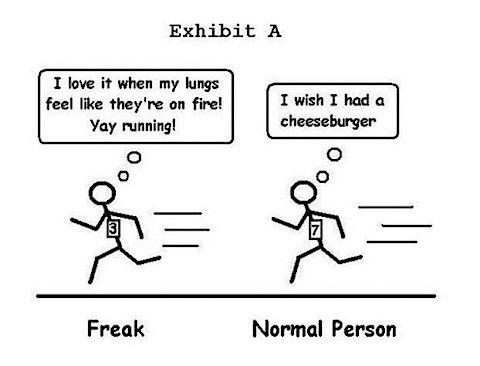 Are you a freak (running or otherwise)? If so, please share! !